A preview of the Music Box Theater's 70mm Film Festival, which runs from September 14-27. 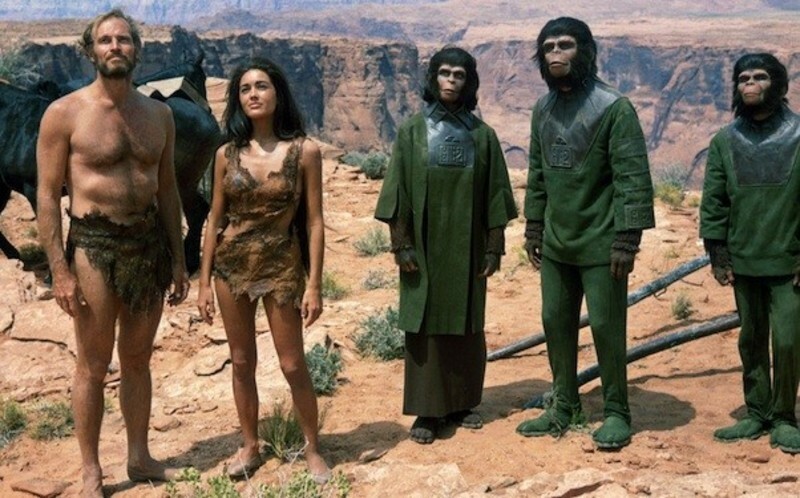 One of my earliest and most memorable movie going experiences was Franklin Schaffner's 1968's "Planet of the Apes". It was presented in my grade school's Cine Club (sort of a small film festival that played one different, semi-recent movie every Saturday during a period of about a month). For weeks prior to the showing I was mesmerized by the publicity artwork which depicted a caged Charlton Heston being repressed by a gorilla. As an eight year old the movie originally struck me purely as a horror piece but it is the other "little things" that still compel me to write about it after all these years. What's more, I believe "Planet of the Apes" with all of its different incarnations: original classic, sequels, remakes and TV adaptations, makes for a wonderful example of cinematic "dos and don'ts" At a glance the first entry in the series may seem like just another monster movie but this is hardly the case. It's too bad neither the majority of the filmmakers involved in the sequels, nor Tim Burton in his remake, were ever able to figure this out. First, the facts: "Patton" (1970) is not only one of the best American movies, but one of the best uses ever made of 70mm widescreen photography. A newly-restored 70mm print of "Patton" has been created by 20th Century-Fox. Here comes the crucial part: The only non-festival booking it will have in the country begins July 3 at the Music Box Theater, 3733 N. Southport. This is a rare opportunity to see a great film in a spectacular presentation.